Here’s a little something I just wrote today. A friend sent me an email about how the Feds stole a herd of cattle from that Nevada rancher, and how militias from around the U.S. are coming to his aid. It looks like a range war may be shaping up. That made me remember Woody Guthrie’s song “Ranger’s Command”, and think how perfectly appropriate it is for the present circumstances. Woody, a darling of the Left, who put a sign on his guitar reading “this machine kills Fascists”, wrote a song that’s totally in the spirit of a cause now being adopted by the Right-wing militias. 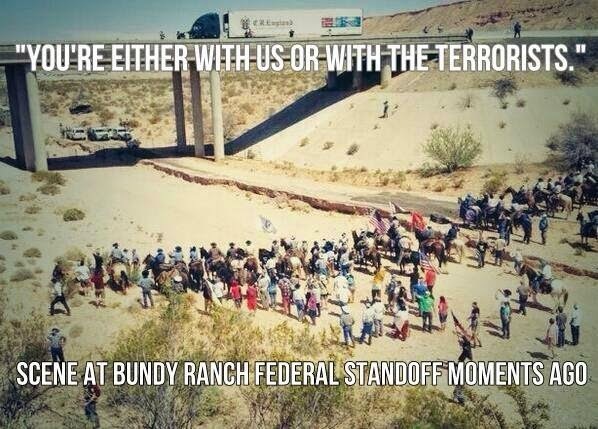 Harry Reid behind the Bundy Ranch land-grab? So you're basically saying "Mothers good, fathers bad." That sounds just as one-sided as the other way around. Christianity writes women out of the reproductive equation with its odd notion of God as "father, son, and holy spirit." But Islam doesn't. In Islam, the two first even slightly tangible qualities of God are "al-rahman al-rahim" meaning "mercy and compassion," compassion and caring," etc. These words connote the kind of love that mothers have for their children. So in Islam, God is at least as much mother-like as father-like. But ultimately of course God is neither male nor female, and far beyond any kind of comparison, including comparison with human beings. Post-Christians like you, Bird, love to project their beefs with Christianity on Islam, without knowing the slightest thing about it. Read Murata and Chttick's "The Vision of Islam" and Michael Sells' "Approaching the Qur'an" – you might be surprised.